Lens welded to housing to form single unit. Requires mounting grommet and 2-wire plug for installation. Features 15,000-hour-rated long-life bulb. Use 142-18 or 143-18 grommet an 142-49 plug. 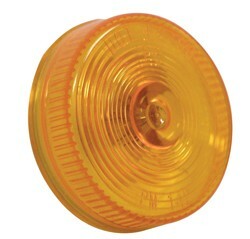 Functions as a side marker or clearance light. Lens is welded to housing to form a single unit. Reuires mounting grommet and 2-wire plug for installation. Bulb lasts approximately 15,000 hours. Use 142-18 or 143-18 grommet and 142-49 plug.